Take the chill out of a cold, February afternoon and enjoy the pairing of two incredible musicians performing original works. 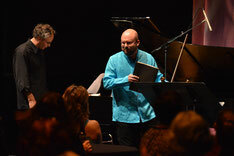 Fewer and Janke have worked together on numerous occasions over the past years on stage, on recordings, and on film scores. The original works by Janke being performed at the concert are featured on the recording Celestial Blue. Take a listen here. Janke was inspired by spiritual music from the U.S. South. SweetWater's Artistic Director will also take some time to provide a preview of what's planned at SweetWater 2017. Don't miss this unique concert event. Tickets for 2 - If buying at the concert, you and a family member or friend can get 2 tickets for $50 ($10 off the general admission ticket price at the door).